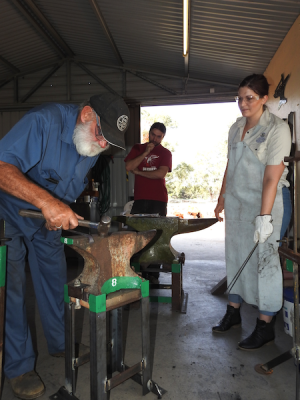 Today was the start of the new Basic Blacksmith Course at Penfield. We had seven new starters arrive at 9 am along with John and Chris. Jen and I set up the BBQ in the new forge, as the weather looked threatening. 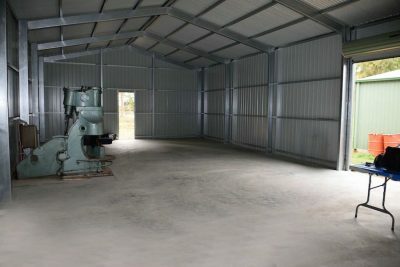 The new concrete floor looks fantastic by the way. Thanks go to Dave Gava for a floorless job. Sorry…couldn’t resist it. Jen had the BBQ cooked by 12 and the troops sat around and got to know each other. The guys got to do a few hours drawing out some square bar to get the feel of moving iron. 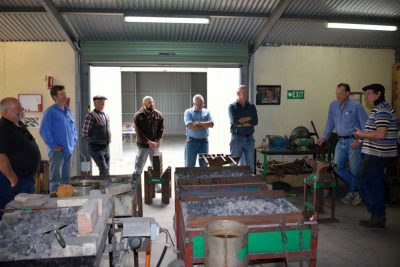 The group has a six-week course ahead of them, and they are all fired up and keen to learn the art. I think they will all appreciate the warmth of the forges in the coming weeks. Today was forecast to be 39ºC. We were supposed to have our electrical tested and tagged but the electrician called it off till later in the week. I can’t say I blame him. None the less, we had a busy day in the forge. Chris Carter, Chris Fuller and myself were out there for the day and we had four blacksmiths roll-up to do some forging. Most of them for the first time. Present today was Tom, Simone, Lydon and Lorenzo. 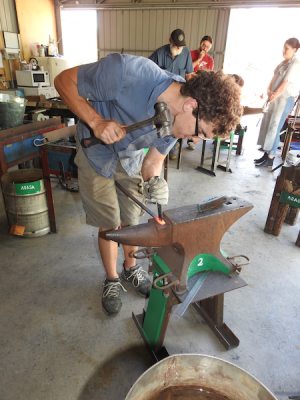 Tom, who forges at the Prospect Hill Forge most Sundays, came along to forge a Horses bridle. A pretty ambitious project, I think you would agree. Lydon, who came down from Yorktown today, signed up as an Associate member, so we welcome him into ABASA. He turned out a pretty good rat tail twist for his BBQ steak fork. 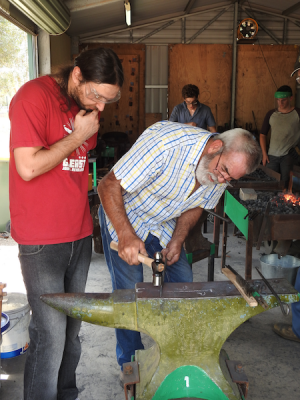 Tom working on his forged iron bridle. Tom made a pretty good fist of it through the day and it was easy to tell he had been around an anvil and forge for awhile. Toms project. 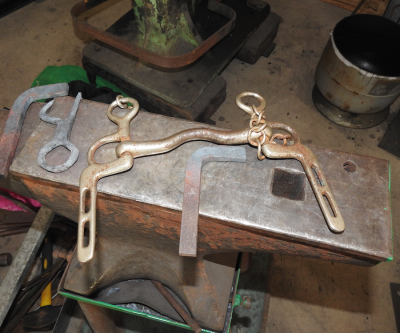 To create a bridle in wrought iron. Meanwhile, Simone had an idea to forge a bottle opener for her partner and have his name stamped on it. Chris was happy to oblige her with his stamps and helped her get the basic forging set up. Lorenzo began his smithing by trying his hand at a basic ‘S’ hook before moving on to a steak flipper, with a little help from Chris Fuller. It certainly was a warm one weather wise, but we all had a great day. At 3 pm the blowers were turned off and finished up for the day.